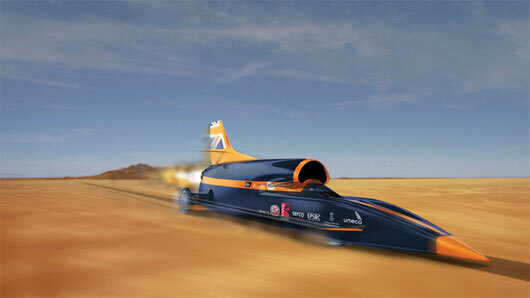 A former Royal Air Force pilot is working with the team to build the Bloodhound SSC to break the speed record of the fastest race car in the world held by the SSC Thrust model. 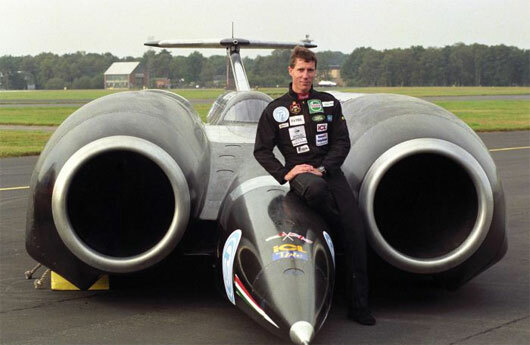 With the Thrust SSC, also known as the fastest race car in the world, Lieutenant Colonel Andy Green, a former fighter pilot of the RAF (RAF), has reached a driving record beyond the speed of sound (1,238km / h) in 1997, with the speed above ground reaching nearly 1,300km / h.
However, Andy Green and his team will set a new record with the introduction of the Bloodhound SSC and the goal of reaching 1,600km / h. Experts said they spent years perfecting the Bloodhound SSC in the most perfect way. Basically, Bloodhound SSC still looks like a wheeled rocket, but has many different characteristics that make it look like a wingless fighter. According to CNN, the car uses an EJ2000 engine, the engine designed for Eurofighter Typhoon jet, one of the world’s leading fighters. The challenge that drivers face when running on the track with the Bloodhound SSC is the shock waves caused by the wheels when traveling at high speed. The testing of Bloodhound SSC is expected to take place in Aerohub, Newquay, southwest England, early next year. If nothing happens, the car will then be transported to the Hakskeen Desert in South Africa, where Green and his team want to set a record at 1,600km / h in 2016. In time In preparation, the research team is completing the plan to make the road nearly 20km long and 3km wide in this area. Bloodhound SSC vehicle and plan to set a high speed driving record of the Bloodhound project. This is a project to inspire scientists and engineers around the world to create new generation vehicles with increasing speed, to meet the application needs in research activities as well. like military. The project now draws the attention of the British scientific community and receives the support of the government’s science and technology agency, universities, and military as well as several other organizations.